Review: Dhaze has been busy in the last five years, hopping from the digital label scene to more established wax imprints such as Metroline Limited and Electronique. His minimal sound has plenty of admirers it would seem, and now he can add Blind Box to the list. 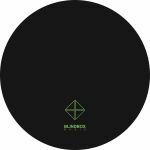 His sound is a perfect fit on the label, focused on crisp, lean floor tracks with steady, razor sharp beats and just the right elements of light and shade darting round in between. B2 track "Ichnusa" might well be the secret weapon on this record with its playful chord lilt and easy going dubby mood.